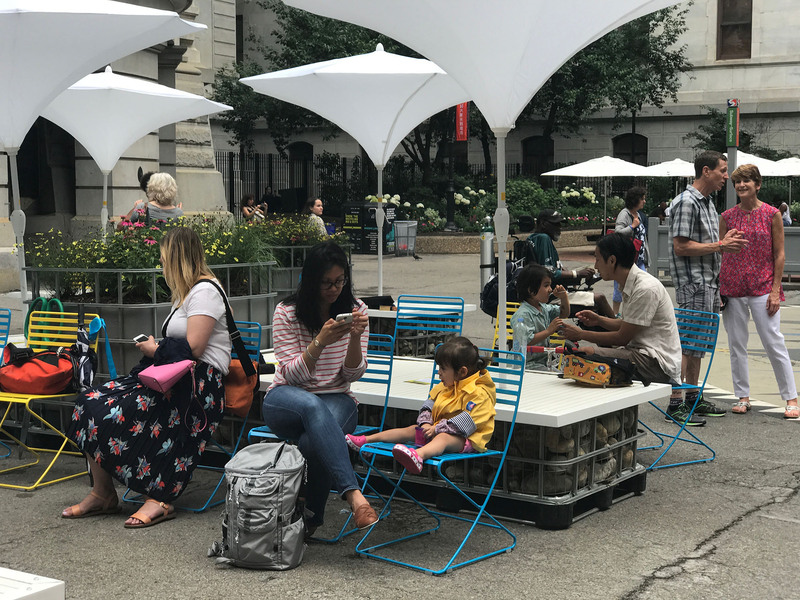 Creative placemaking and interactive programming were the keys to transforming Philadelphia’s City Hall courtyard into an engaging and interactive civic commons that celebrates the city’s rich history and its sustainable future. 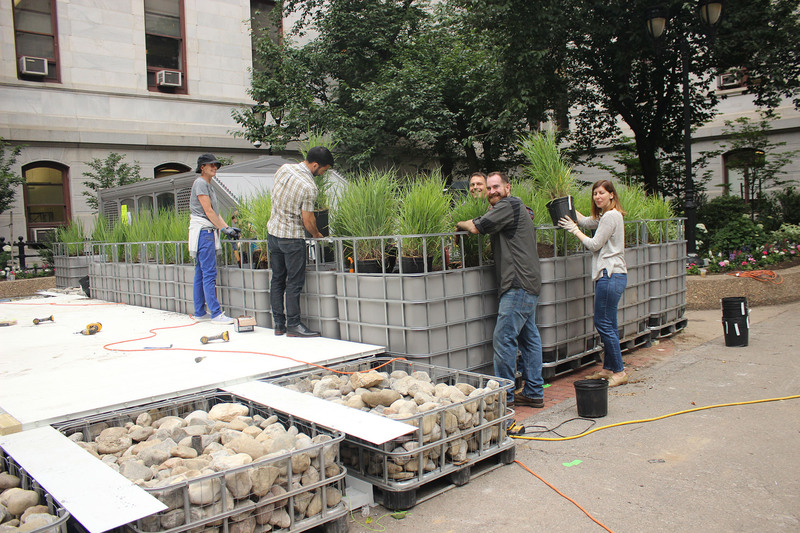 The project was conceived and implemented trough the collaborative efforts of three principal City agencies – Philadelphia Planning Commission, Philadelphia Water Department, and the Department of Public Property with support from the Mayor’s Fund for Philadelphia. 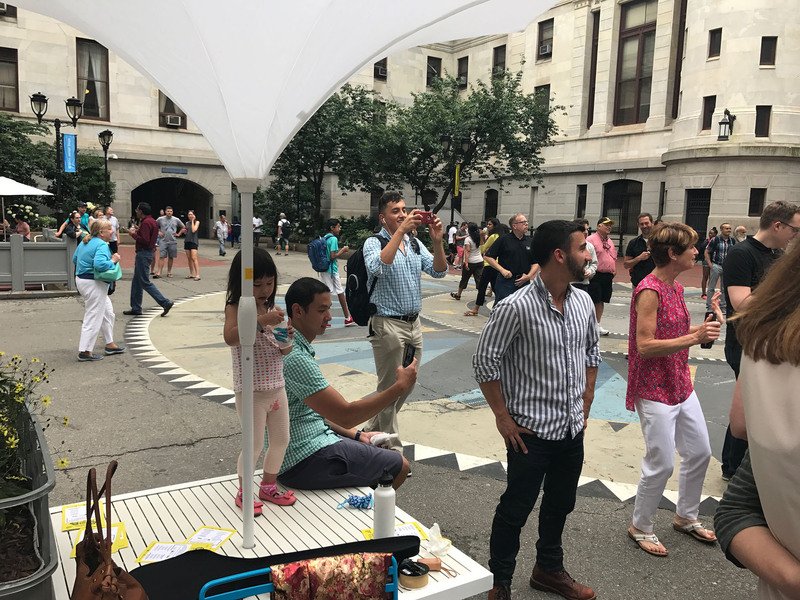 While working on Philadelphia’s City Hall Courtyard PPS engaged with the city’s Office of Arts, Culture and the Creative Economy, who through programs and events were the main programming partner for the space. A special goal for our team was to highlight and encourage the contributions of Philadelphia’s vibrant artist, maker, and fabricator community. For that purpose, after developing some initial concepts for the space, based on the input from the community at large, PPS and its City partners developed a Request for Proposals to select a local designer/fabricator for a custom-made modular stage and seating feature. 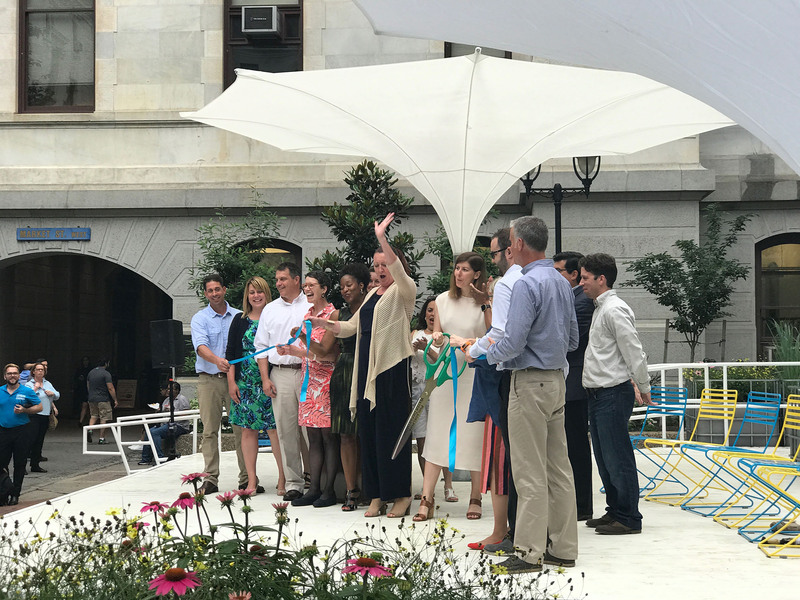 The team Ex;it, Sikora/Wells/Appel, designers and Reilly Remodeling fabricators were selected to design, produce and install the feature in the courtyard. An integral part of the team for the fabrication and installation were volunteers from the Challenge Program, a local non-profit organization that empowers at-risk youth. 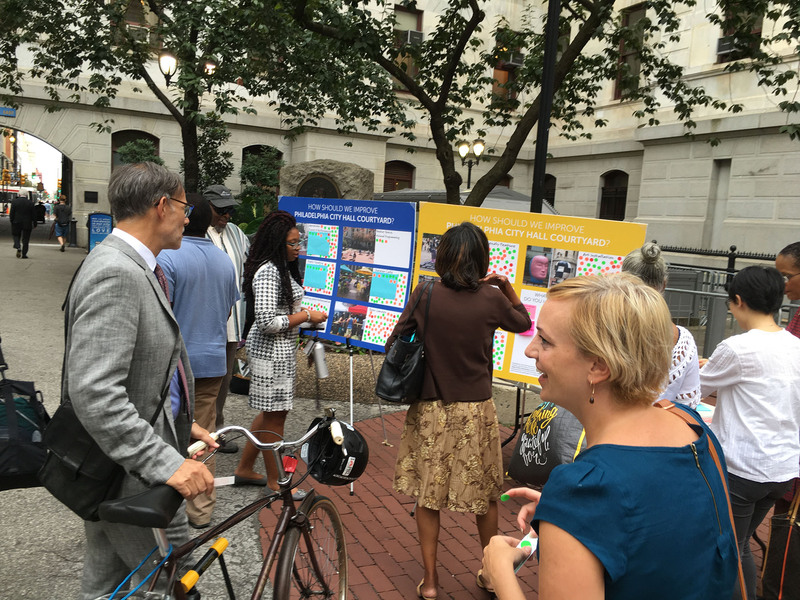 In addition to physical amenities, a local graphic design team developed new signage with a tag line “Everyone is welcome to City Hall Courtyard” and translations in the four most spoken languages in Philadelphia. The project partners were able to obtain additional contributions for implementation from various city departments including Public Property and the Water Department. 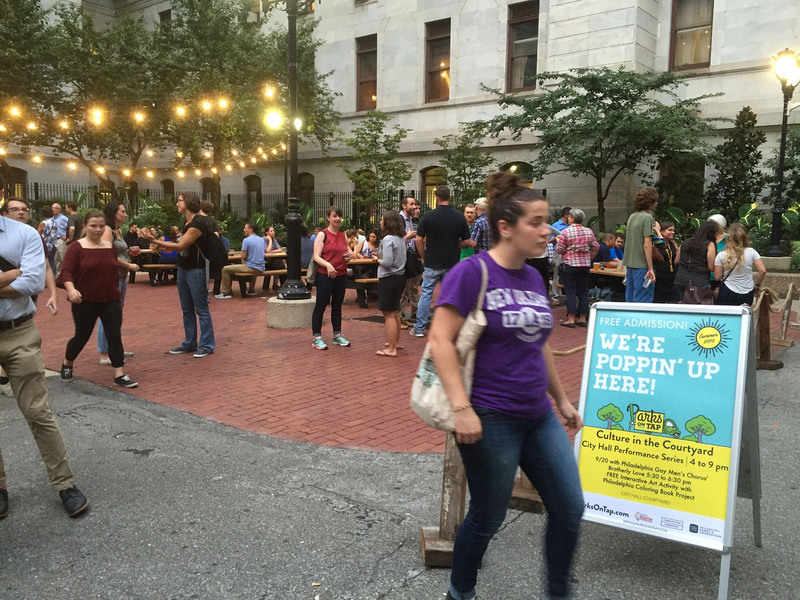 Arts and programming funding was augmented with support from the Office of Arts, Culture and the Creative Economy; Monument Arts; Philadelphia Parks and Recreation, the Fairmount Parks Conservancy and FCM Hospitality via the Parks on Tap program. While originally it intended to dismantle and store the stage during the winter season, the project team decided to keep it in place for the Christmas Village installation providing a place for impromptu performances and a spot for visitors to meet, sit and rest.